The fruitarian diet, which often includes nuts and seeds as well as fruits, can result in dramatic weight loss, depending on which fruits you eat and in what quantities. However, the fruitarian diet can also cause serious nutritional deficiencies unless you make a concerted effort to get enough protein and fat in your diet. If you have health issues, talk to your doctor before following this restrictive diet. Some fruitarians follow a stricter set of rules than others. Most fruitarians get at least 75 percent of their food volume by weight from fruit, according to former fruitarian Thomas Billings. 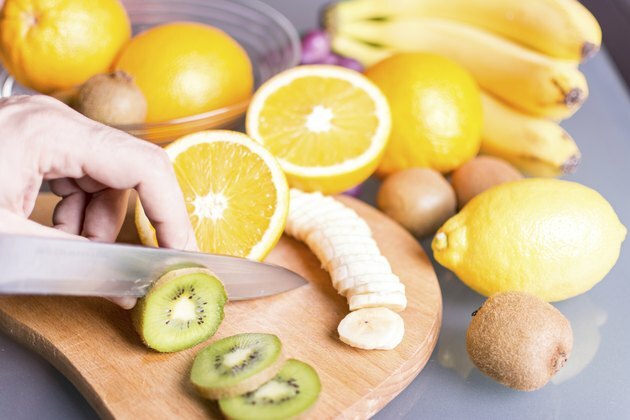 The seven fruit groups include acid fruits such as citrus; sub-acid fuits such as apples and cherries; sweet fruits such as bananas and grapes; dried fruits; nuts; seeds; and oily fruits such as olives, avocados and coconuts. Because fruit is generally low in calories, it's difficult to consume enough calories to stay above the starvation level, according to the website Beyond Vegetarianism, which states you would need to eat between 8 and 13 lbs. of fruit per day for adequate calorie intake. Weight loss occurs when you take in fewer calories than you burn each day. How much weight you lose on a fruitarian diet depends on your calorie intake. Calorie intake will depend, to some extent, on which fruits and nuts you eat and in what quantities. Avocados, for example, contain 160 calories. If you need to consume 1,600 calories to maintain your weight, 10 avocados per day would supply them. One cup of dates contains a whopping 490 calories; 3 cups a day would nearly fulfill your daily needs. Nuts are also high in calories, around 400 calories per 1/2-cup serving. Not all fruitarians will lose weight. Extreme weight loss is not the only effect you may see from following a fruitarian diet for any length of itme. You may also develop nutritional deficiencies of protein and essential fatty acids unless you consume enough nuts, seed and avocados, which contain protein and fats. You may also develop calcium, iron, zinc, vitamin D and B vitamin deficiencies,especially B-12., according to Columbia University's online Health Q&A site, Go Ask Alice. A fruitarian diet that contains large amounts of oily fruits and nuts may not result in any weight loss at all, while eating low-calorie fruits like apples, melons or berries could result in dramatic weight loss. As with any diet that restricts foods, you must maintain a balance that supplies essential nutrients. For fruitarians, the fruits that supply protein and fat also supply more calories than fruits made mostly of carbohydrates. What Would Happen If I Ate Only Fruit?